Bring the Mickey Park Combo to your next event! This licensed Mickey Park bouncer & slide combo will bring friendship and activity to all players with its trademark Mickey ears on the top of each tower. Colorful digital artwork features Mickey and Minnie, Daffy and Daisy, Goofy and the trustiest dog in Mickey Park, Pluto. Kids can run and jump for hours with all their favorite characters, even chase a friendly face down the versatile wet/dry slide. This bounce house combo offers up to four different activities for endless hours of activity with a large interior jumping area and a basketball hoop for group interaction, and comes with a climb to conquer with a fun and fast slide, entertainment for even the most active child! High-visibility mesh allows spectators to keep an eye on participants. Manufactured with lite n strong , fire resistant vinyl for safety, durability and portability for any indoor and outdoor party. 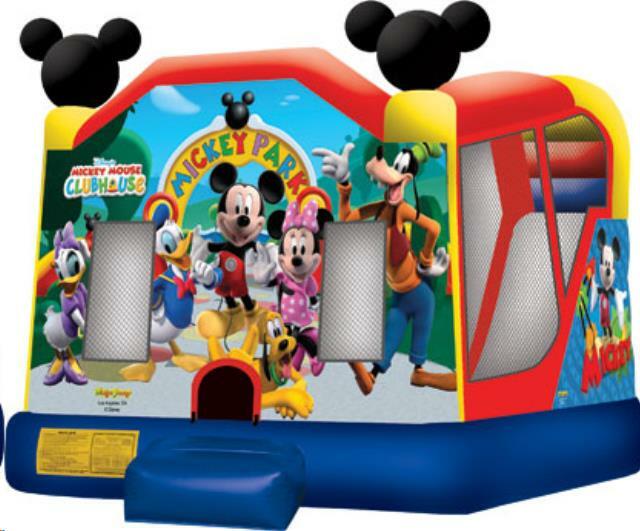 * Please call us for any questions on our mickey park wet/dry slide/bounce combo rentals in Rocky Mount and Wilson NC.